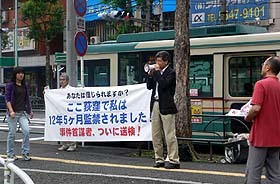 Toru Goto has been abducted and held in confinement twice in his life. The first such experience was in 1987 when he was 23 years old, working for a general contractor. Goto's older brother, a former member of the Holy Spirit Association for the Unification of World Christianity (HSA-UWC)or the Unification Church, persistently approached his parents to deprogram (kidnapping to coercivelyconvert a person from his faith) Goto, who had also converted to the Unification Church, so that theycan bring him out of the church. The method of being confined in hotel and apartment rooms, beingcompletely cut-off from the society and the world, was the same approach that his brother faced. Onlythis time, Goto was able to find a chance to escape. The second abduction happened on September 11th, 1995. Upon returning to his parents' home in West Tokyo City, while he was having dinner, his father approached him and said, "Toru, I have atalk with you." At that moment, the expressions on the faces of his family members (his parents, brother and his wife, and sister), who had been sitting around him, had become rigid. Suddenly his older brother and father grabbed both of his arms and dragged and forced himinto a van parked in front of the house. He had been taken to a room in a condo (apartment building) inNiigata City. The door had been equipped with a special lock from the inside, and the windows alsowere locked with a special lock. Upon arriving, his brother had shot a remark at him, "There will be nocompromise nor will there be any changes in your situation until we solve this problem!" At that time, Minister Matsunaga of the Niitsu Evangelical Church appeared and talked tohim about the Bible as well as pointing out problems of the Unification Church. On top of that, heexpressed to Goto, "I'm sure there will never be such opportunity again, so please reflect deeply." It wasalways a one-sided dialogue all throughout his confinement, but none of the arguments was reallyimpressive or persuasive for him. In June 1997, his confinement was moved to a room in a condo in Ogikubo (in Tokyo), but thesituation had not changed. They also had special locks and he was under constant surveillancethroughout the day. He was held in this condo in Ogikubo for the remaining 10 years for his confinement and was not able to set even one foot outside during this time. Takashi Miyamura, aprofessional deprogrammer and a president of a company, would bring five or six former members andhis company employees and surround Goto to talk him out of his faith. Goto would then decide to do a 30-day hunger strike in a strong intention of protest towards hisconfinement. However, even after his fast, he was only given small portions of side-dishes three times aday and a liter of sports drink. This would continue for roughly 70 days. This was explained to him as, "food-sanction". "I really might die." Goto had thought many times, and so he quietly tried to take even someseasoning (sauces) from the refrigerator, but he was eventually caught and so his family hid everythingfrom him. He was even caught picking carrot peels and the cabbage butts from the garbage, and so eventhe trash was kept away from him. When Goto had finally been liberated from his second confinement, it was February 2008. Before his confinement, he had weighed 68kgs or 150lbs (he is 182cm or about 6 feet tall), but at thetime of his release, he weighed 39kgs (85lbs). As he was extremely weak (from malnourishment andlack of exercise), it is said that he had to be helped onto a digital weight scale because he was not ableto even stand. He was immediately hospitalized and slowly regained his health. Later, Goto would havehis mother, brother and his wife, sister, Miyamura, and Minister Matsunaga charged and arrested forconfinement, and his lawsuit has been sent to the prosecutor's office.